As you can see by the paltry number of posts this month, December has been a pretty busy month in every sense but the culinary. I had all sorts of plans to do baking and post a bunch of ideas for the holiday season, but alas . . . . What is it they say about the best laid plans? I did make Peter Reinhart's stollen recipe (awesome), and I have finally figured out what to make for Christmas dinner. Since I will be feeding vegans and omnis alike, I wanted to make something that could be enjoyed for what it was, and not some imitation of a meat dish. Enter the phyllo! 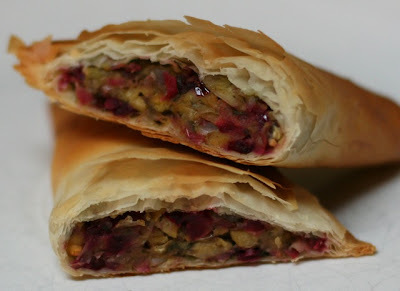 The filling is chickpeas with cranberries and spinach: tasty and also red and green for Christmas. 1. Heat oil in a frying pan over medium heat. Saute onion, garlic, and celery for 5-7 mins, until soft and translucent. 2. While onions are cooking, pulse chickpeas, cranberries, and spinach in a food processor. Make sure not to process into a paste. 3. Place chickpea mixture in a bowl, then add onions. Add chestnuts, flour, and spices and mix well. Season to taste. 4. 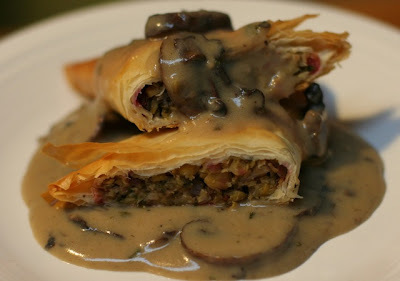 Place one sheet of phyllo on the counter and brush with melted margarine or oil. Place another sheet on top and brush with oil. Cut phyllo lengthwise into three long strips of equal width. Place a scant 1/4 cup of filling at the bottom of each strip. Fold like you see here. Brush folded triangle with oil or margarine. Place on a baking sheet lined with parchment paper. 5. Repeat with remaining filling. Bake for 15-20 mins, until golden brown. I served mine with roasted mushroom gravy. As you can see, I could not really figure out how to present the dish. On Christmas day I just plan to put them on the plate with all the other veggies and not worry about how it looks in a picture.